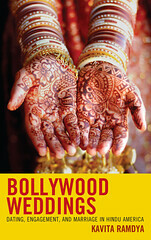 Click here to read the “Bibi Magazine” review of Kavita Ramdya’s “Bollywood Weddings”. Click here to read it in PDF. Click here to read the first review of Kavita Ramdya’s “Bollywood Weddings” in the “Asian Voice” newspaper column “Spriha’s Corner“. Even as the world has fallen into the pit of what is called as the global financial crisis, it has definitely not affected the marriage market. In the past few weeks, I received almost two dozen marriage invitations and all of them have a glitzy flavour to it. From a theme wedding to a historical set up in one of the palaces in Jaipur, the marriage market seems to be always on a high. But what is even more interesting is the amount of creativity involved behind organising a wedding. It’s almost like shooting an entire film that has emotional drama, larger than life setting, songs and the most special of all is the entry of the prince charming making his way on a white horse to take his Cinderella in a world where they will live happily ever after. A banker by profession and a writer by choice, Kavita’s debut book looks into the mindset of the young generation of Hindu Americans who are trying to give their traditional Hindu wedding a western flavour. She tries to examine how the second generation of Hindu Americans adopt and reject the various elements of the Hindu and American mainstream marriage rituals. Before writing the book, the author spent nearly two and a half years carrying out an anthropological study of Indian – American Hindus in the tri-state New York area. Her research included going out into the field and conducting interviews of couples and attending more than 20 weddings – Hindus and Jews, Christians and Atheists. It is here that she came across the question that “why do people fall in love and then plan extravagant weddings?” This question remains central to the entire book which takes a very close look at how the Bollywood film industry has inspired many couples when it comes to planning their wedding. 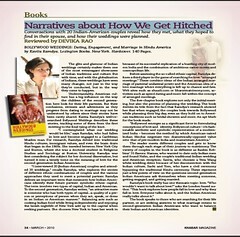 In her own words, the author says that it was by accident that she came across the theory of the influence of bollywood in Hindu American marriages. For those settled outside, it is always a mix of two worlds – be it British or American. One of the findings that caught my attention during the read was a hybrid model of “arranged meetings” between the boy and the girl. It is a true amalgamation of two cultures – both Indian and American. So in this case, as much as the parents have a say in who their son/daughter should marry, even the individual suitors have the freedom to look through thousands of portals like shaadi.com to find a person who suits their criteria. Thus in many ways it is a sort of a compromise between the older and the younger generations on the question of marriage. The book gives a very clear insight not only into the minds of Hindu Americans but the present generation of Non Resident Indians who might have never been to India but still try and maintain a balance between the two cultures. And it is bollywood that brings the Indian culture and rituals to their door step. One of the interesting observations made by the author is that the biggest impact of bollywood is on the Wedding wardrobe. The new generation is seen to have styled their clothes in a way that is worn by film stars and struck poses in wedding photos that are quite similar to Hindi movies. All I can say is that it is a very engaging book that hooks you on once you have started. As I said in the beginning, it takes you on this journey that everybody loves to make in their lives – from small introductions to dating then to courtship and then to a lavish dream wedding. And the tinge of bollywood in between all this spices up the entire book.